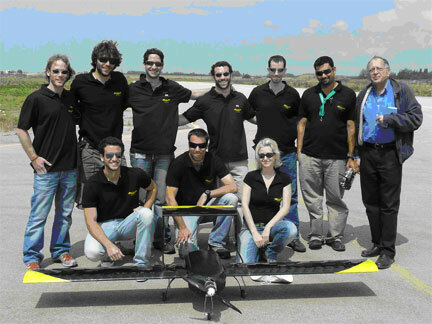 BATMOBILE is a project Designed Built and Flown within the framework of the Technion Aerospace Engineering Faculty design project. The project is subjected to limitations dictated by the AIAA/Cessna/RMS Student Design/Build/Fly Competition. The primary objective is to maximize the total flight score, which is comprised of three missions to be completed in succession: a ferry flight and two payload flights. The ferry mission (Mission 1) requires the empty aircraft to fly two laps as quickly as possible, whereas the payload missions involve carrying a maximum of 10 softballs ( Mission 2) and up to 5 bats (Mission 3). Each mission rewards a low system weight. Mission 1 and Mission 3 scores also consider flight time, whereas the Mission 2 score includes payload loading time. Therefore, a successful aircraft must be lightweight, fast, and quick to load. The aircraft must also take off in less than 100', and fit inside a 2' x 2' x 4' dimension enclosure case when unassembled. For the aircraft design process we took drag, weight, manufacturability and reparability, stability and control, box restrictions and cost as our main evaluation parameters. This process yielded a modular configuration with a tractor propulsion system, conventional wing, dual boom bronco tail and a tricycle landing gear. Analysis showed that in order to take off within 100', the aircraft must have a good lift to drag ratio as well as lift coefficient values of at least 1.4, which is why an MH 114 airfoil was selected. Moreover, a span of 7.87 feet, wing area of 7.75 square feet and aspect ratio of 8 were chosen in order to make the 100' takeoff limitation. A composite frame fuselage was built in a cylindrical shape. Flight and landing scenarios were simulated by concentrated forces on the landing gear hard points and on the wing joints. Load distribution was analyzed by using the Theory of Elasticity, identifying areas of concentration. These processes yielded a composite cylinder 50mm in radius, sufficient for the selected motor. A strong, lightweight baseball tub was molded from carbon. The tub has a grid structural pattern for fast loading time and for restraining the internal payloads while also serving as an integral part of the fuselage structure. The bats are affixed to the baseball tub using carbon rings. Each ring is bolted to the baseball tub, into a pine grasp that was put in place during the initial building of the baseball tub dividers. The primary wing is made mainly of balsa and built around a main beam, at the root it is comprised of a circular carbon fiber beam completed with two 6X6 mm pine beams. In the middle of the wing it is replaced with a standard "I" shaped beam. Two additional beams were added (front and aft) for strength, as well as allowing the connection of ailerons. The propulsion system consists of a Neu 1506/2.5Y motor and a 6.7:1 gearbox driving a 18×10 / 18×11 / 17×11 propeller and powered by 22 / 28 / 28 Elite 2000 battery cells (missions 1 / 2 / 3 respectively). Predicted aircraft performance capabilities for missions 1 / 2 / 3 are as follows: takeoff distances of 68 / 82 – 90 / 93 feet, wing loading of 1.5 / 2.0 / 2.3 lb/ft , thrust-to-weight ratios of 0.47 / 0.36 / 0.31, and stall speeds of 29/ 32-34 / 34.5 ft/s. Predicted mission performance capabilities for Missions 1 / 3 are as follows: cruise speed of 51 / 46 ft/s and flight times of 116 / 244 seconds. Total loading time for Mission 2 is about 13 seconds, and Mission 3 payload is 5 bats.